Data shows that for every level of education beyond a high school diploma median annual full-time wages and employment in Minnesota increase. 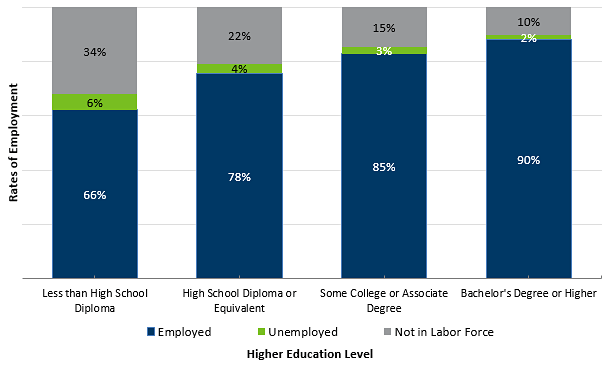 In today's changing work world employers value employees who have had education beyond high school and tend to employ them over someone with only a high school diploma. Most jobs available today for someone with only a high school diploma or less are in low-skill retail, food service and other jobs that tend to pay low wages with limited financial advancement opportunities. A recent article from the Star Tribune, "An American fault line: High school-only grads left behind" highlights the economic gap between adults with and without college. These same trends are seen in Minnesota's workforce. College does not mean only obtaining a bachelor's degree. "College" refers to any education beyond high school. Minnesota's institutions training students for technical careers are called "State Colleges." There are hundreds of programs provided by Minnesota's postsecondary institutions offering training for technical career occupations that require two or less years of training. Graduates can obtain an associate degree or other non-degree career-specific certificates. Note: "Some College" also includes those who completed one- or two-year certificate programs. Search employment and wage outcomes of Minnesota graduates working in the state with the Minnesota Graduate Employment Outcomes tool. Matching graduate data from the Minnesota Office of Higher Education with wage data from the Minnesota Department of Employment and Economic Development enabled the development of this web-based searchable tool. 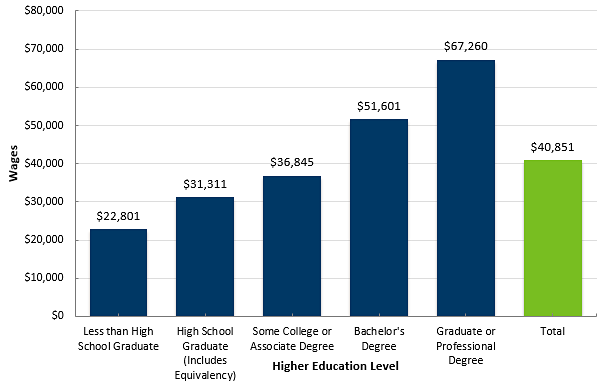 One of the goals of this tool is to help students make sound financial choices on how much to pay for college education based on employment outcomes of college graduates of specific programs/majors by level of award obtained. The Minnesota Department of Employment and Economic Development also has a Career Profile tool showing wages, demand and job opportunities for specific occupations by geography in Minnesota.